Are you serious about Pilates? Whether you are an instructor, beginner or advanced student in Pilates, the Sissel foam roller is for you. 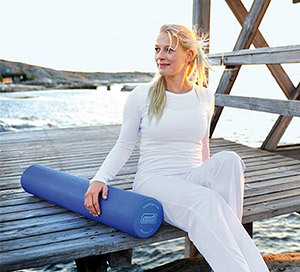 The Sissel Pilates Roller Pro has been specially designed to meet all of your exercise needs. It boasts harder/firmer compositions designed specifically for the Pilates training and exercises. It is also suitable for self-massage of muscles to warm them up before gym training, or for cooling down after you have exercised. It’s a fantastic way to relieve your muscles of tension and achieve maximum benefit and results after you have exercised. You will receive your Pilates roller with a detailed poster of many different Pilates exercises to try, test and assist you during your training. You can’t go wrong! Foam rolling has many benefits which your body will love. Increases blood flow to your muscles – This improves the delivery of oxygen amid your workout. Increases your range of motion - Foam rolling can actually aid in stretching out and lengthening your muscles, which will maximise the benefits of your workout! Make it part of your regular routine. Relives muscle tension – your muscles need it after a hard workout! Really focus on those sore areas. Decrease your recovery time – Ever feel ridiculously sore the day after your workout? Foam rolling can assist in your muscle repair process, so you don’t have to feel the full wrath of delayed onset of muscle soreness. Can reduce cellulite – Because foam rolling improves your circulation, it can also help with the removal of waste toxins from your muscles, meaning that foam rolling can help to reduce cellulite. Incorporate the Sissel Pilates Roller Pro into your Pilates or exercise regime today and start reaping the rewards of the simple yet highly effective practice.